RAYS flow Control, Inc is pleased to announce that it has been awarded certification for Council Directive 2014/68/EU Module H of the Pressure Equipment Directive in August 2017, Notification Body No. CE 1155. The certification authority is SGS Portugal SA which covers design, production and final inspection and testing of gate valves, ball valves, globe valves, check valves and butterfly valves. 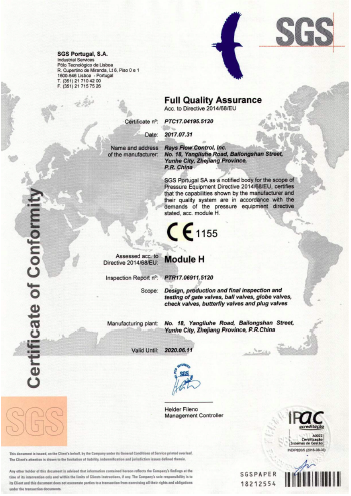 This certificate has played a positive role in the expansion of RAYS FLOW CONTROL’s products in the European market. The Pressure Equipment Directive (PED) 2014/68/EU (formerly97/23/EC) of the EU sets out the standards for the design and fabrication of pressure equipment (“pressure equipment” means steam boilers, pressure vessels, piping, safety valves and other components and assemblies subject to pressure loading) generally over one litre in volume and having a maximum pressure more than 0.5 bar gauge. It also sets the administrative procedures requirements for the “conformity assessment” of pressure equipment, for the free placing on the European market without local legislative barriers. It has been mandatory throughout the EU since 30 May 2002, with 2014 revision fully effective as of 19 July 2016. This is enacted in the UK as the Pressure Equipment Regulations (PER). The set out standards and regulations regarding pressure vessels and boilers safety is also very close to the US standards defined by the American Society of Mechanical Engineers (ASME). This enables most international inspection agencies to provide both verification and certification services to assess compliance to the different pressure equipment directives.